Performance Time: Approximately 45- 60 mins, 46 pgs. FARCE. 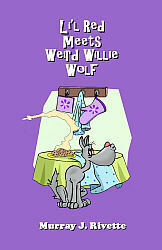 Willie Wolf, a vegetarian who stopped eating meat after he accidentally ate a skunk, suffers from a terrible sweet tooth. When he spies Li’l Red on her way to her granny’s house carrying a basket of cookies, Willie races to Granny’s house, where he hypnotizes Granny, stashes her in a closet, dons her spare nightgown and nightcap, and eagerly waits for Li’l Red to arrive with the sweet treats. Meanwhile, two dimwitted hunters, Barry and Larry, who also happen to be sugar freaks, spy Li’l Red’s basket of goodies and track her to Granny’s house. Cookies and card tricks abound in this crazy comedy!